Are Wood Bed Slats Sturdy? Question: I want to know if it is OK to use wood bed slats on a bed and are they sturdy? Answer: For years and years wooden slats were the mainstay of virtually every bed built. They were and are still today a crucial support component for the boxspring and mattress, but do they really get the job done? Wood slats were used on mom and dad’s, grandma and grandpa’s old bed , but most mattress stores use steel bed frames as support in their beds today. Perhaps you’re buying a new bed that comes standard with wood slats don’t you want to know if they are sturdy and strong enough? You should – because many fall short of the designed intent. While they may be common, they are not without their problems. These beds are often very easy to install and look beautiful. Simple wooden side rails hook into the headboard and the footboard. The heart of the support structure relies on wood slats. Without this support the boxspring or the foundation of a mattress would fall through to the floor. While some are strong and sturdy, many of these beds use low quality slats that are not made from hardwood like oak or poplar. Making things worse, they use wood that is too thin and flimsy and not nearly enough of them. Finally many of these slats do not have supporting feet. Without each of these “little” things strength and boxspring support is significantly compromised. What Kind of problems can I expect from wood slats? The most common problem is bowing. This is when flimsy thin slats begin to droop or sway like an old hammock. One thing that can stop this sway is using sturdy legs for support in the middle of the slats. Some offer adjustments for different height beds. Hard wood is a must and as mentioned poplar, oak, or some other hardwood will add needed strength to beef up the support system, although we recommend using steel instead of wood. Slats should number 5 or more and be a few inches wide to help evenly distribute box spring weight. Evenly distributing the weight and getting it to the floor properly can do other things. In addition to the bowing and sagging mentioned above poor weight distribution can be as costly and damaging. Most wood side rails are not designed to take the brunt of the weight and without evenly distributed weight some of which needs to be directed to the floor we risk major damage to the side rails like cracking, splitting, or worse they may completely break. 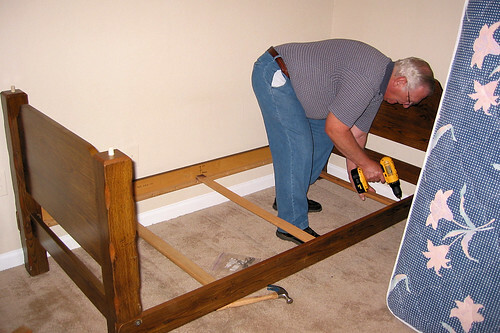 Another resulting problem is where the rails hook into the headboard and footboard excessive weight can cause cracking, splitting, or breaking of the headboard. In either event it can be at best a costly repair or at worse a useless bed. Is there a stronger alternative replacement that will do a better job? Just like we don’t build skyscrapers out of wood we shouldn’t use wood for our bed slats. The strength of steel is the answer. Strong tempered angle iron slats that screw firmly into place is best because they don’t flex and they do not bow. Steel slats comply with all mattress manufacturers ‘ warranties. Center support legs are adjustable and usually accommodate beds that are from 5 to 12 inches tall. Companies like Leggett & Platt®, Knickerbocker, Mantua , and Glideaway they manufacture and distribute to their mattress and furniture retailers various forms of such support. Glideaway who I am most familiar with offers a couple center supports that will get the job done called the G-Force I and G-Force II. Save yourself some money and check them out. Questions about what kind of supports to use on your bed contact us or email us a photo of your bed. We’re here to help you with you purchase a safe durable center support for your bed. I recently purchased a slat bed, twin size, with a trundle. The trundle also has slates. Each has quite a few slats, so quantity doesn’t seem to be the problem. However, when I was putting it together I did notice that if I pressed my knee into one of the slats it would bow. Not a surprise. My question is, can I use angle iron to reinforce the bed – specifically by attaching angle irons to some or all of the slats. I plan to use the bed and trundle for guests and would like it to last a while. The trundle complicates things – cannot put posts under the bed for support. Do you think the angle iron would do much to help? Would it cause other issues? I saw your advice on slats and was wondering if you could help me. I live in the UK and we bought a day bed with slats for my son (9yrs). This bed is not sold as a kids bed and is meant for adults also. My wife sat on the bed and fell through it damaging tendons in her hand. I’m a product design engineer and know about design. I looked at the slats and they are made from ply (Chinese ply I think) 2″ wide and about 0.3″ in thickness. With a load of 20lbs at the centre of the strut the struct deflected 4.5″ to a point it was about to pull out of the plastic end caps. There are 13 slats on the bed and when you sit on the bed about 4 of the slats are taking the load of an adult. Do you have any bed wisdom for me please? I have a metal bed with a horizontal support bar and center leg. Can I put wood slats on this, or do I need more support? I will be using a memory foam mattress. Hi Doug, my son have a wooden bed, at first he had 3 slats, a bunkie board and a mattress on top. He broke the bunkie board and 2 slats. Do you think I can get more slats, like 13; and just a mattress on top? Do you think the slats would support the mattress or do I have to get another bunkie board? I thank you so much. Shelel. Recently, as in last night, I visited a friend who just purchased a new house. She bought all new furniture and a bed with wood slats was what she put in the guest room where I slept. It was very comfortable and I found it extremely easy to fall asleep on. The problem happened at about 5am when I was awoke by a ‘crack’ of the center wood beam that holds the support slats like a spine. This caused the bed to drop which obviously woke me up. I was mortified and thought that it was something that I did. I was the first big person to sleep on it. I’m about 220 but I was told that a female had already first slept on it who was petite. My question : Is there a weight limit or is there a way that the wood spine leg slipped causing extra pressure on the spine, which caused it to crack in only one night? We have a queen bed that has wooden slats. They are very creaky and starting to bow. Would putting a boxspring on top of the slats help solve this problem by distributing the weight of the mattress more towards the outside of the bed so the center of the boards don’t bow as much?